Holiday Gas Prices Lowest In Four Years : The Two-Way The national average for regular is $3.45 per gallon, down from an all-time high of $3.83 per gallon over the Labor Day 2012 holiday. 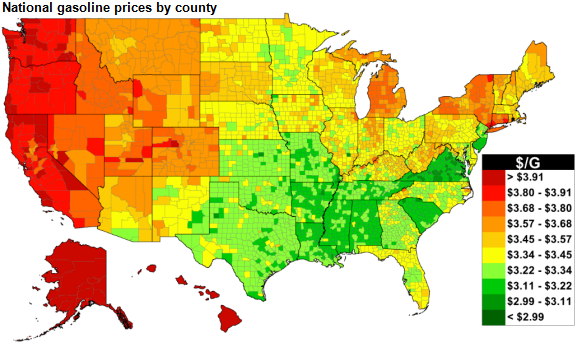 A graphic produced by Gasbuddy.com shows regional variation of gas prices. Some good news heading into the long weekend: Labor Day gas prices are at their lowest level in four years. The U.S. Energy Information Administration says the nationwide average for retail regular was $3.45 per gallon on Aug. 25 — that's the lowest average price for a Monday ahead of Labor Day since 2010, and it's about $0.25 per gallon less than at the end of June this year. The current price is down from the record average of $3.83 for the 2012 holiday. EIA says the recent decline in prices is mainly due to changes in the price of crude: "In June of this year, the Brent spot price reached its year-to-date high of $115/barrel (bbl), then fell to $102/bbl on August 22. Current Brent prices are below their August average level over the past three years, which ranged between $110/bbl and $113/bbl. Crude oil prices were lower in 2010, as the global economy was just beginning to recover from the 2008-09 recession that reduced oil demand." "The energy markets have shrugged off tensions in the Middle East, the Ukraine-Russia conflict and minor supply disruptions during normal peak summer driving season. "But with demand now at seven-year lows and daily North American oil production at five-decade highs, geopolitical risks are having less impact on oil prices. "Even news of a larger-than-expected drop in oil supplies is having little impact." "Prices are lowest on the Gulf Coast ($3.24/gal) and highest on the West Coast ($3.83/gal) as of August 25. Gulf Coast prices are often low compared with prices in other regions because of the Gulf Coast's proximity to half the nation's refining capacity — its gasoline production is greater than the region's consumption — and because it does not rely on supply transferred from other U.S. regions or imported from the global market. West Coast prices are often higher than those in other areas of the country because of the more restrictive gasoline specifications in California, the region's dominant market. As of August 25, prices in the Rocky Mountains region and East Coast averaged $3.65/gal and $3.40/gal, respectively." Earlier this month, an Edmunds survey noted that nearly three-quarters of all Americans were either definitely planning a road trip for the holiday or considering it.